Sometimes, insights into the nonprofit and philanthropic world come from unlikely places. In this week’s Washington Post coverage of the quarterback turmoil—the benching of Robert Griffin III—in Washington’s NFL franchise, columnist Mike Wise raised questions about the silence of General Manager Bruce Allen. It seems clear that the NCAI didn’t accept Allen’s offer to negotiate, but the presumption is kind of stunning. Just think: Snyder, through his lieutenant Bruce Allen, approached the nation’s major civil rights organization for Native Americans and thought they could find some sort of price or accommodation that would allow Snyder’s team to retain a disparaging racial epithet as the team name. Obviously, Snyder’s Original Americans Foundation hadn’t done the trick, as most people saw the new “foundation” as a pretty ham-handed effort to use philanthropy to buy support among Native American tribes. Maybe it would have been a direct contribution to NCAI’s coffers? Perhaps Allen was inspired by Donald Sterling’s contributions to the NAACP in Los Angeles, which was apparently more than willing to laud Sterling’s support of causes in the black community and ignore his racial track record as a real estate owner and developer and as a racially biased owner of an NBA team. 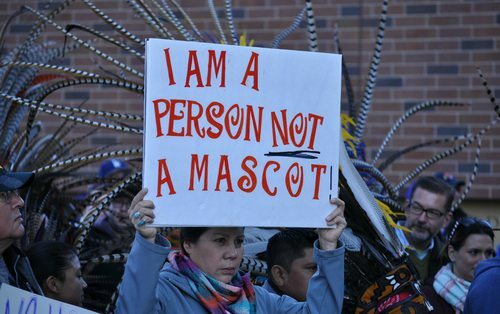 It is striking that an entity such as the Washington NFL team, or perhaps simply its general manager, believed that a racial group would be willing to sell its outrage over a racially disparaging team name (plus disparaging team mascots and paraphernalia) for any amount of money. On the other hand, for some corporate entities, that’s the way business is done: Use philanthropy, use charitable giving, make a deal, and buy off critics of corporate policy.